You don’t need a Windmill to reduce your power costs…just some smart thinking. 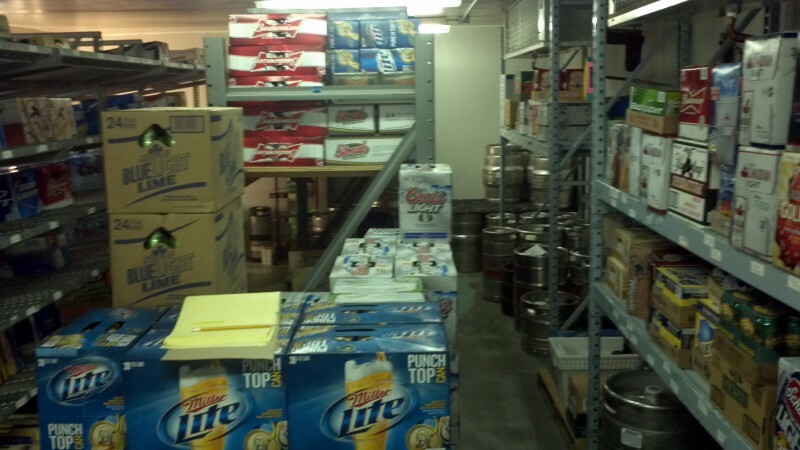 Ok , to start – the basics of refrigeration. The fridge thermostat is set to the required temperature for the contents of the fridge. For this example, we’ll use 5°Celcius as the set point. The fridge is switched on and starts to cool the AIR inside the fridge cabinet down. Once the AIR temperature reaches 5° , then the thermostat sensor relays the temperature data to the control system, which then shuts of the compressor. In normal usage, as the fridge is opened and closed, the AIR inside the fridge will warm up as when the door is opened, the natural process is that cooler air from inside the fridge flows out and the warmer air outside the fridge flows in. This causes the air temperature inside the fridge to increase – the thermostat sensor then picks this up and causes the compressor to come on and cool the AIR temperature down again to the set point of 5°. For Saving Energy on refrigeration , the amount of energy used to re-gain the set point of 5° will depend on how high the Air temperature gets inside the cabinet. So, it will take more energy to cool the air from 12 to 5°, than from 8 to 5°. NOTICE – this is all about AIR temperature – Not product temperature. In energy saving,there is a difference. Food or most products kept in a fridge will retain their temperature for longer periods than air – this is because of the difference in density between air and water. Since most products contain high levels of water – they keep their internal temperature much longer. SO- in the usual environment – YOU ARE WASTING VAST AMOUNTS OF ENERGY KEEPING THE AIR TEMPERATURE AT THE SET POINT! RATHER FOCUS ON KEEPING THE PRODUCT TEMPERATURE CONSTANT – THIS IS SAVING ENERGY. What is the ENDO CUBE / ECUBE ?- These 3 minutes could save you a fortune. It’s simple – the less times your fridges start up in an hour – the less energy they use. – the more profit you make. The less times they start up , the less time they work. The less they work, the fewer times they break down. The fewer times they break down, your maintenance costs come down. Get it? The Thermo Cube / ENDO Cube / E CUBE is a device that does exactly that. It changes the source of the temperature data from AIR to WATER (PRODUCT IN THE FRIDGE) – and so cuts the number of times your fridges start and stop in an hour. That is SAVING ENERGY on Refrigeration. Think of it like this – in your fridge is a block of cheese and a cucumber. You open the fridge door and cake out the cheese. Leaving the door open – you cut some cheese for a sandwich. You make your sandwich, all the time leaving the fridge door open – it takes 5 minutes to make that sandwich. Having finished making the sandwich, you then put the cheese back in the fridge and close the door. In that 5 minutes has the AIR in the fridge warmed up? YES. Did the cucumber warm up? NO.NO. NO. So why does the fridge need to switch on ? To cool the air ? NO.NO.NO. IT DOESN’T have to switch on at all because the Cucumber(product in the fridge) HAS NOT WARMED UP! The ECUBE represents the latest technology in Temperature Mimicking Sensors designed for saving energy on refrigeration in commercial and industrial refrigeration systems. The Key to this device is the specially formulated wax compound at the core of the ECUBE that simulates the core thermal properties of produce , meat , dairy , fruit , veg etc. By providing the thermostat control system with temperature readings based on the product tmeprature inside the refrigerated space , rather than the fluctuating air temperature , the ECUBE allows for the refrigeration system to operate at superior efficiency , reducing the number of compressor starts per hour as well as the running time of those compressors. This allows for Control System Optimisation (CSO) through an effective dampening system utilising the measurement of product temperature – as temperature is the core element of Control System management , the switch between measuring Air temperature (current system) and product temperature delivers unparalleled energy savings in both KWH and KVA , as well as reducing peak demand levels thus saving energy on refrigeration. By reducing the compressor cycles , the ECUBE also delivers the reduced maintenance , fewer breakdowns , decreased repair costs and less wastage in product and efficiently delivers saving energy on refrigeration for your business. This is done by maintaining accurate temperature within the fridge and produce , the occurrence of widely fluctuating air temperature dynamics is reduced significantly and thereby prevents the evaporation and condensation cycles that occur within the core of the product under normal operational conditions. Overall , the ECUBE has proved itself in a variety of test conditions and in each case delivered 15%-33% reduction in consumption – this clearly shows that the ECUBE is efficient at saving energy on refrigeration systems. Combined with the reduction in wear and tear , breakdowns and wastage- the total saving could be reasonably increased by a further 10%-15%. In Tests conducted from 3 September to October 4 2009 and verified by an independent specialist energy consultant (In Energy) , the data proved conclusively that the E CUBE delivered the energy saving results as seen in the United Kingdom. 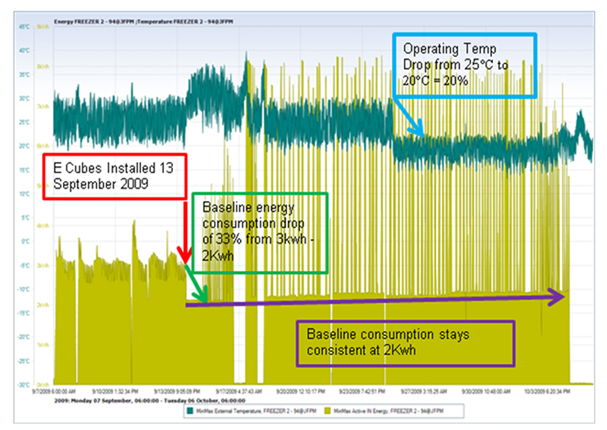 The Graph below shows the effect of the CUBE immediately upon installation and resulted in saving energy on refrigeration. The Baseline consumption drops swiftly from 3kwh to 2 Kwh and even more interesting is that prior to the E CUBES being installed , the fridges were running without product inside, with product packed and the ECUBE installed , the fridge runs at 33% less energy and over a period of 7 days , the fridge unit is running 5°C lower than without the E CUBE. The fridge temperature WAS NOT ADJUSTED IN ANY WAY for the test period. This is the effect of the ECUBE stabilising the internal temperature due to the accuracy of the specially formulated wax core. Normally , cooler running fridges use MORE Energy than warmer running units. The Spikes in temperature are due to the opening and closing of the units in their normal operational function – to aerate the bananas and allow the gases to escape. To do this , the fridges are opened for at least 30minutes to an hour every day and this would not include removal and repacking of stock as required. The point to note here is that the sharp spikes indicate the effectiveness of the Cube in retaining its temperature. To expand this point , in normal operating conditions without the ECUBE , these spikes would be wider and extend for a longer period of time as the air temperature would rise between 8°C and 12°C as the fridges are opened for aeration. It would take the control system far longer (and therefore use more significantly more energy) to return the internal temperature to its set point. The ECUBE allows the fridge unit to run far more efficiently as it does not warm up nearly as much, maybe by only 3°C or so. To cool the E CUBE back down by 3°C rather than the air volume by 8°C requires considerably less energy – thus the sharp spikes seen in the graph. The graph to the left shows the consumption in KWH of the Banana Ripening Plant , with the E CUBEs installed by Point 3 above. The drop from a high point of 271737 Kwh to 196842 Kwh is a reduction of 74895 Kwh or 27,5%. The average consumption without E CUBE is 263144 KWh , with E CUBE 228370 Kwh. This is a reduction of 34773 KWh or 13%. The graph to the right shows the consumption data in KWH for the Ammonia North Plant. The average consumption without E CUBE is 282024KWh , with ECUBE is 252632 KWh . This is a reduction of 29391KWh or 10,4%. The high point of 291375KWH to the low point after E CUBE installation at 217555KWH is a drop of 73820KWH or 25%. The graph to the left shows the consumption data for the Ammonia South Plant. The average without E CUBE is 88017KWH , with E CUBE 85182KWH. This is a reduction of 2835KWH or 3,2%. 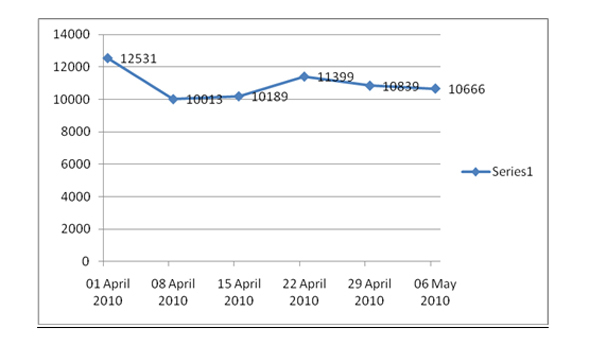 This is the lowest reduction of all the plants at Joburg Market and the sharp rise in consumption in May of 2010 is , as yet, unaccounted for. 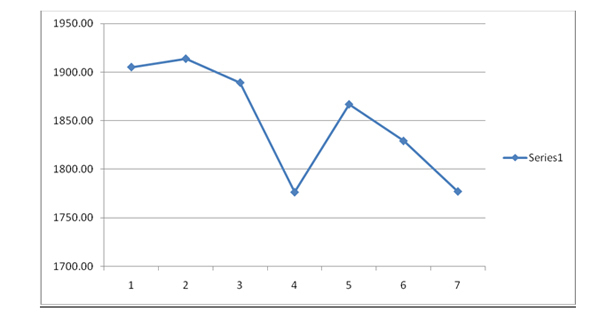 The high point without E CUBE of 90211KWH down to the Low point with E CUBE of 78460 KWH is a drop of 11751KWH or 13%. The graph (left) shows the overall total consumption data for the entire cooling plant with an average of 633085KWH per month without E CUBE down to 543171kWh per month . This is a reduction of 90424 KWH per month or 14,27% average per month. Month on month since the E CUBE installation has seen consistent reductions in KWH usage and no doubt this also reflects in KVA usage as well. 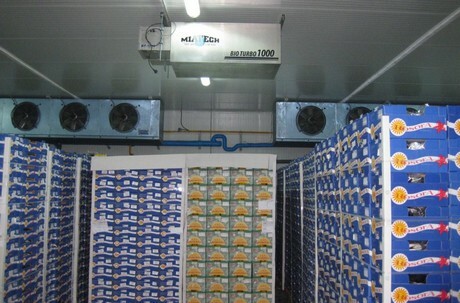 Joburg Market were the first to utilise saving energy on refrigeration using this technology. The test was conducted at the Wiesenhof Shop at Glynwood Hospital , which uses a Three Phase system in store. The graph below shows the total consumption for the store drop by 6,72% per phase and a cumulative reduction of 18,55% thus saving energy on refrigeration for the business owner. The test was conducted from 8 March 2010 to 4 May 2010. The test was conducted at the Wiesenhof Three Rivers store , which uses electricity for refrigeration and cooking purposes. The reason for this test was that the store at Glynwood uses gas for cooking. To determine whether the CUBE would deliver similar saving energy on refrigeration results in a store that utilised electricity for both cooking and refrigeration the site at Three Rivers was chosen for the second test. 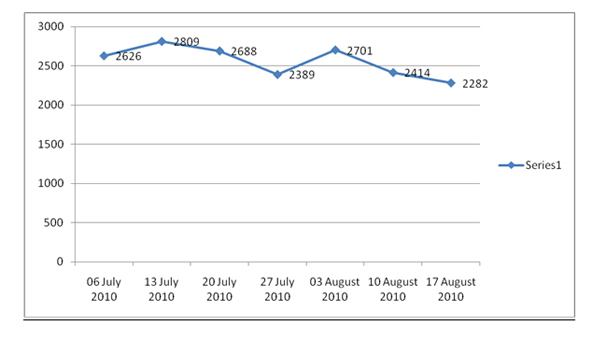 The Graph below shows the consumption data starting with 2626Kwh at July 6th 2010 and 2809 Kwh at July 13th 2010.This is an average consumption of 2717 Kwh per week. The ECUBE is installed on July 20 2010 and , as per the consumption patterns seen in the other tests , the system takes 14 days to settle into the new operational function. Within a week of installation , the consumption has dropped to 2389 Kwh , a drop of 328Kwh per week or 12% less than average. Note that the final two weeks of the test saw considerably WARMER weather than the 2 weeks previous two weeks , with temperatures into the mid 20’s from the mid teens. The following week sees the characteristic spike and thereafter the consumption drops to 2414Kwh (303Kh or 11% less than average) and then by 17 August the consumption is down to 2282 Kwh per week (435 Kwh or 16%) below the average. Again, saving energy on refrigeration was clearly shown in these tests as well. OBC Chicken is a supermarket style configuration , utilising cold rooms , freezer rooms , display fridges , dairy fridges, island fridges and cold drink fridges , very similar to the layout of your typical supermarket operation. The test was conducted from the 25 March 2010 to 6 May 2010. The graph below shows the consumption data from the test site , with the baseline consumption without the ECUBE at 12531 KWh per week. E CUBEs were installed in all 20 fridge units in the store and the effect thereof is immediate. Within the first week of testing , the E CUBE reduced the consumption by 2518 Kwh per week , a significant 20,09%! That’s saving energy on refrigeration. The second week saw the consumption rise slightly to 10189KWh , an increase of 176Kwh per week or 1,7%. The energy consultants working with the OBC store then reset the systems and adjusted thermostat settings in the store , resulting in an increase of 1210Kwh per week or 11%. 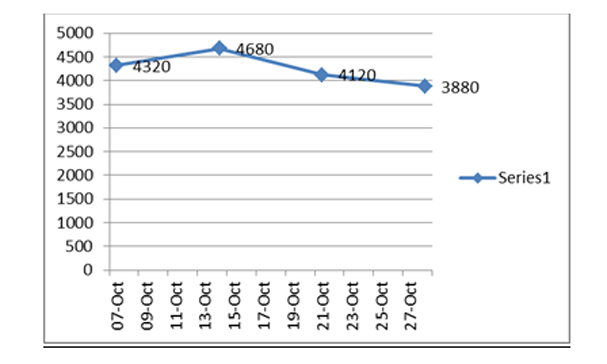 The consumption then begins to drop again as the system readjusts to the reset operational parameters dropping 560Kwh to 10839Kwh per week which is 5% and then to 10666 Kwh per week or 733 Kwh down from the peak (6,4%) and a week on week drop of 1,6%. 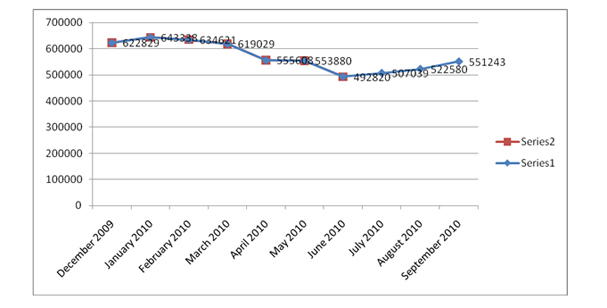 On the KVA side , the ECUBE reduced the KVA from 102 KVA per month to 76KVA per month , an effective reduction of 25,4%. The graph (right) shows the clear decline in overall consumption in kWH at the test store and presents a probable and continuous pattern of decline and then stabilisation of consumption once the system settles fully. Week 2 : 17 % = 800 kWH per week = 3220 kWh per month. This is equivalent to almost a full week’s consumption in saving. The E CUBE will continue to maintain this level and would deliver greater results for saving energy on refrigeration once the fridge unit thermostats have been re-adjusted to around the 5°C/6°C level. Prior to the ECUBE installation , the 3 underbar fridges at the bar were consistently measuring 5°C – 6 °C. Once the ECUBES were installed , those same fridges are now measuring a consistent temperature of 0°C – 1°C. This shows that the ECUBE is achieving high levels of savings (avg 14%) over the two weeks with the fridges running 4°C – 5°C LOWER . A resetting of these fridges to 5° C would allow the consumption on these units to be reduced further by an estimated 3%-5% (conservatively) and could be as high as 8%-10%. This pattern is typical of the ECUBE’s performance in super-accurate temperature control within a fridge unit , reflecting the temperature of the product rather than the typical air temperature systems. Due to the difference in thermal properties between air and product , the actual product temperature is reflected and shows the over-use of energy in standard installations to maintain a highly unstable air temperature rather than a more stable product temperature. It is this simple change in operational dynamics that allow for maximum control system optimisation and efficient energy use in the fridge. If you own a business that has refrigeration as the primary consumer of energy, you SHOULD be talking to us about the ECUBE. For Saving Energy on refrigeration get in touch with us today.